Thousands of separated parents are being wrongly charged Bedroom Tax and are entitled to rebates after a shock legal ruling. A tribunal decided that a child of parents living apart is ­entitled a bedroom in each of their homes for visits. And the judge said Bedroom Tax should not apply. The bombshell judgement in Middlesbrough is set to open the floodgates to claims by other Bedroom Tax victims that they were charged illegally. The landmark decision was made by tribunal judge A.N. Moss in the case of a father who had 14% docked from his Housing Benefit. A local authority decided the single man was under-occupying his two-bed semi. But he argued the extra room was used by his son under a deal by which the boy stays up to three nights a week with him. But the Tories may try to protect their hated tax – because the Sunday People understands Work and Pensions Secretary Iain Duncan Smith will appeal the ruling. Foodbank workers have revealed they handed out hot water bottles to a cash-strapped mum – so she didn’t have to put her children to bed with their coats on. And a blind pensioner with no family was also found living on custard creams because he had fallen behind with his gas payments. Such devastating tales of hardship are witnessed on a daily basis by husband and wife, Sarah and David Jones who set up The Kings Storehouse foodbank in Rhyl in 2012. An ex-solider left disabled after a hit-and-run crash while out on his bike, had his benefits stopped because he couldn’t get to the Job Centre fast enough in his wheelchair. Despite his cupboards being bare, a man suffering with Asperger’s syndrome turned down a Fray Bentos pie that was inside a food parcel because it would cost him £3 to put his oven on for 30 minutes, and he only had £10 left in his meter. The worst off are having to turn to The Kings Storehouse to make it through their cash crisis – mostly caused by innocently falling foul of benefit rules. Today Barnet Homes and Barnet Council acted with utter contempt for ex-Sweets Way resident and domestic violence survivor, Jennifer, telling them they will not offer her any support, and leaving her with a letter suggesting she contact Shelter and find her own solicitor before she becomes homeless on the 2nd of June. This is truly disgusting and an absolute lack of respect for both Jennifer’s circumstances and for the rules of local government in these situations. 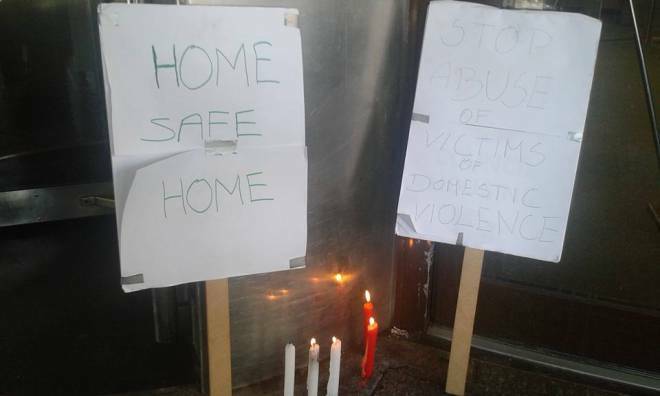 Following the meeting, we blockaded the front of the Barnet Homes office for several hours in protest, and left candles (pictured above) in memory of the many women who have lost their lives to domestic violence. The number of North people being kicked out of their rented homes is now at its highest level in a decade, according to latest figures. Statistics from the Ministry of Justice (MoJ) show that the number of residents removed from rented accommodation by court bailiffs in the past two years is the highest recorded level for any two-year period going back more than 10 years. These figures include evictions by social as well as private landlords. Between April 2013 and March 2015, 1,847 households across the region were booted out by the courts, with 1,720 of these repossessions occurring in social housing. Homeless charity Shelter labelled the statistics a “glaring reminder that sky-high housing costs and welfare cuts are leaving thousands of people battling to keep a roof over their heads”. And he called on the government to strengthen the housing safety net to “make sure people aren’t left to fall through the cracks and hurtling towards homelessness”. Meanwhile Coun Nick Forbes, leader of Newcastle City Council, blamed increasing pressure on household budgets for evictions in the city.